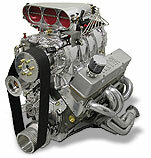 The engine is being built my master machinist Scott Sehr from Sehr Performance Machine, on the web at: www.sherpower.com. To follow the build up step by step, follow the Links below. The Articles are in order and may also be paged through one at a time. 17th Engine Artcle: The Heads Arrive!